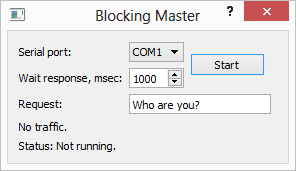 Blocking Master shows how to create an application for a serial interface using the synchronous API of QSerialPort in a worker thread. The asynchronous (non-blocking) alternative. Operations are scheduled and performed when the control returns to the Qt event loop. The QSerialPort class emits a signal when the operation is finished. For example, the write() method returns immediately. When the data is sent to the serial port, the QSerialPort class emits the bytesWritten() signal. The synchronous (blocking) alternative. In headless and multithreaded applications, the wait method can be called (in this case, waitForReadyRead()) to suspend the calling thread until the operation has completed. In this example, the synchronous alternative is demonstrated. The Terminal example illustrates the asynchronous alternative. The purpose of this example is to demonstrate how to simplify your serial programming code without losing the responsiveness of the user interface. The blocking serial programming API often leads to simpler code, but it should only be used in non-GUI threads to keep the user interface responsive. This application is the master which demonstrates the work paired with the slave application Blocking Slave Example. The master application initiates the transfer request via the serial port to the slave application and waits for response. MasterThread is a QThread subclass that provides API for scheduling requests to the slave. This class provides signals for responding and reporting errors. The transaction() method can be called to start up the new master transaction with the desired request. The result is provided by the response() signal. In case of any issues, the error() or timeout() signal is emitted. Note, the transaction() method is called in the main thread, but the request is provided in the MasterThread thread. The MasterThread data members are read and written concurrently in different threads, thus the QMutex class is used to synchronize the access. The transaction() method stores the serial port name, timeout and request data. The mutex can be locked with QMutexLocker to protect this data. The thread can be started then, unless it is already running. The wakeOne() method is discussed later. In the run() function, the first is to lock the QMutex object, then fetch the serial port name, timeout and request data by using the member data. Having that done, the QMutex lock is released. Under no circumstance should the transaction() method be called simultaneously with a process fetching the data. Note, while the QString class is reentrant, it is not thread-safe. Thereby, it is not recommended to read the serial port name in a request thread, and timeout or request data in another thread. The MasterThread class can only handle one request at a time. This makes it possible to create an object while running the loop. It also means that all the object methods are executed in the scope of the run() method. It is checked inside the loop whether or not the serial port name of the current transaction has changed. If this has changed, the serial port is reopened and then reconfigured. The loop will continue to request data, write to the serial port and wait until all data is transferred. Warning: As for the blocking transfer, the waitForBytesWritten() method should be used after each write method call. This will process all the I/O routines instead of the Qt event loop. The timeout() signal is emitted if a timeout error occurs when transferring data. There is a waiting period for response after a successful request, and then it is read again. Warning: As for the blocking alternative, the waitForReadyRead() method should be used before each read() call. This will processes all the I/O routines instead of the Qt event loop. The timeout() signal is emitted if a timeout error occurs when receiving data. Afterwards, the thread goes to sleep until the next transaction appears. The thread reads the new data after waking up by using the members and runs the loop from the beginning. See also Terminal Example and Blocking Slave Example.